A great value for a reasonable rate is the premise by which Uvas Pines was founded. Uvas Pines welcomed its first guests in 1995 and has since been a repeat destination for many. Long-time RVers Bob & Charlene Taylor retired to Morgan Hill and constructed Uvas Pines to the exacting standards of what a fellow RVer would most like. The first considerations were relaxation, quiet, scenic natural beauty, and spaces wide enough so that Charlene could back a 36ft, 5th wheel pulled by a long bed dually in on the first try. As long as the space was that wide, why not make it big enough to park your car/truck/toad there as well? And that’s how the Park was conceived and built. On our property, we offer walking trails, picnic areas under the shade trees by the year- round creek, an expansive lawn area for friendly strolls or lawn games, and acres of open land to leash up your pet and take him for a walk or run (please pick up the droppings!). Alternatively, you may choose to ride the scenic Uvas and Oak Glen roads (a favorite route for the Specialized Bicycle Team). The wildlife includes seasonal deer, quail, wild turkey, hawks, a wide variety of birds, raccoon, squirrels and even an occasional wild pig or skunk. 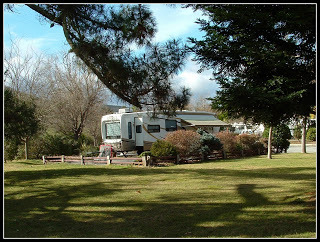 Uvas Pines RV Park has 40 premium spaces. To keep the park in tip top shape, over the years management has regularly improved and added amenities including free Wi-Fi, propane sales, fax service, and mail delivery to the park office. There is no extra charge for large motor coaches or the elbow room and relaxing atmosphere.